It's hard to know how to even start. 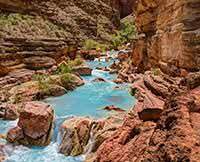 Simply put, Western River Exepeditions provides the greatest way you could experience the Grand Canyon. My family and I loved every moment of the rapids, the crew, scenery, and newly-met friends. Mark and the rest of our crew were very knowledgable, fun, and made the trip a wonderful experience. They can also cook up a mean meal for 30+. The Bar 10 Ranch was a fantastic experience and provided spectacular services to keep everyone entertained, relaxed, and well-fed. I cannot recommend this trip more. If you have even the slightest desire to see the Grand Canyon, this is the way to do it.